Both bride & groom claim to be residents of Bradford, McKean Co., PA. Bradford is located just south of the New York – Pennsylvania Border. It took me a while and a few Googles before I figured out where the marriage took place. It looks like “Hinqua” or perhaps “Minqua”. There is a historic tribe in PA named Minqua. But as towns, these names stumped Google so I tried looking for lists of towns in McKean Co., since this is where they lived. Nothing interesting there. Next I checked in Warren County where the license was acquired. I almost missed it because I was looking for a name ending in “qua”. Turns out there is a Kinzua Beach and a Kinzua Heights (near each other) in Warren County. I am quite sure that’s the right place. Here is a close-up. What do you think? I was disappointed the record did not contain very much information. However, they were married by a minister, so perhaps there is a church record with more data. 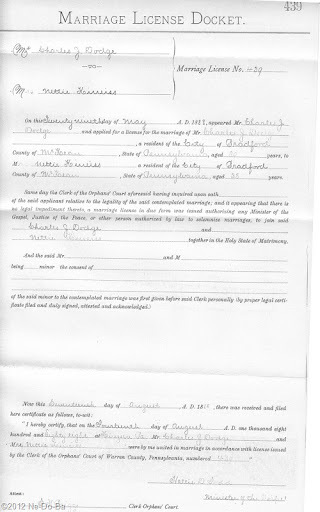 Ancestry.com recently added a Pennsylvania Church Records database. Guess I will head on over there to see if I can find something more. I decided to poke around some more to see what I could find about the towns, county, etc., and discovered some Directories for the town of Bradford covering the years 1887 to 1893. Might I be lucky enough to find them listed? Yes! Of course I can’t be certain yet and this is a transcript record so it could have errors, but this really does fit nicely with what I already know. This certainly is a very sweet little find. I love it when I find pieces of information that collaborate with each other like this. This confirms the couple that married in Kinzua in 1888 actually did reside in Bradford about that time. Now the question would be, why did they get married in a different location? Also of interest is the long period of time between obtaining the license and the time they actually were married. They waiting through June, July, and half of August. Perhaps they were waiting for some special event or day. The Bradford Directories cover the years 1887 to 1893, but the Dodge’s are only found in the 1889-90 book. This would suggest they moved away after a short stay. As a carpenter, perhaps Charles has to move to where the good jobs are. I wonder if something big was being built in Bradford about this time that might require a carpentry force to build? At some point, I should look for information about the minister who married them. I wonder if there is something special about the church or location? Learning about him, his church, and the location might help me understand why they married in a different town. These are things I can explore in the future if I am still looking for clues to Leonette’s ancestry. If I had the time, I might locate a map of the city of Bradford in this time period and figure out just where they were living. Any readers out there looking for a small research project? The little town of Kinzua no longer exists. It was flooded in 1965 with the building of Kinzua dam on the Allegheny river. Several towns and cemeteries were moved in the early 60's. Kinzua was one of them. I figured it might be something like that. We have a town like that here in Maine called Flagstaff – now at the bottom of Flagstaff Lake.